This application is a continuation of U.S. Ser. No. 10/388,890, filed on Mar. 14, 2003; which is a continuation of U.S. Ser. No. 10/092,936 filed on Mar. 6, 2002; which is a continuation-in-part of U.S. Ser. No. 09/518,488 filed on Mar. 3, 2000, and claims the benefit of U.S. Ser. No. 60/345,934 filed on Jan. 3, 2002. All of the applications identified above are incorporated herein by reference in their entirety. The term “cell”, in the context of the present invention, is intended to mean a single unit formed from a sealed microcup. The cells are filled with charged pigment particles dispersed in a solvent or solvent mixture. The male mold may be prepared by a photoresist process followed by either etching or electroplating. A representative example for the preparation of the male mold is given in FIG. 3. With electroplating (FIG. 3 a), a glass base (30) is sputtered with a thin layer (typically 3000 Å) of a seed metal (31) such as chrome inconel. It is then coated with a layer of photoresist (32) and exposed to UV. A mask (34) is placed between the UV and the layer of photoresist (32). The exposed areas of the photoresist become hardened. The unexposed areas are then removed by washing them with an appropriate solvent. The remaining hardened photoresist is dried and sputtered again with a thin layer of seed metal. The master (FIG. 3 b) is then ready for electroforming. A typical material used for electroforming is nickel cobalt (33). Alternatively, the master can be made of nickel by nickel sulfamate electroforming or electroless nickel deposition as described in “Continuous manufacturing of thin cover sheet optical media”, SPIE Proc. Vol. 1663, pp. 324 (1992). The floor of the mold (FIG. 3 d) is typically between 50 to 400 microns thick. The master can also be made using other microengineering techniques including e-beam writing, dry etching, chemical etching, laser writing or laser interference as described in “Replication techniques for micro-optics”, SPIE Proc. Vol. 3099, pp76-82 (1997). Alternatively, the mold can be made by photomachining using plastics, ceramics or metals. The microcups are filled with charged pigment particles dispersed in a dielectric solvent. The dispersion may be prepared according to methods well known in the art such as U.S. Pat. Nos. 6,017,584, 5,914,806, 5,573,711, 5,403,518, 5,380,362, 4,680,103, 4,285,801, 4,093,534, 4,071,430, 3,668,106 and IEEE Trans. Electron Devices, ED-24, 827 (1977), and J. Appl. Phys. 49(9), 4820 (1978). The charged pigment particles visually contrast with the medium in which the particles are suspended. The medium is a dielectric solvent which preferably has a low viscosity and a dielectric constant in the range of about 1 to about 30, preferably about 1.5 to about 15 for high particle mobility. Examples of suitable dielectric solvents include hydrocarbons such as decahydronaphthalene (DECALIN), 5-ethylidene-2-norbornene, fatty oils, paraffin oil, aromatic hydrocarbons such as toluene, xylene, phenylxylylethane, dodecylbenzene and alkylnaphthalene, halogenated solvents such as perfluorodecalin, perfluorotoluene, perfluoroxylene, dichlorobenzotrifluoride, 3,4,5-trichlorobenzotrifluoride, chloropentafluoro-benzene, dichlorononane, pentachlorobenzene, and perfluorinated solvents such as FC-43™, FC-70™ and FC-5060™ from 3M Company, St. Paul Minn., low molecular weight halogen containing polymers such as poly(perfluoropropylene oxide) from TCI America, Portland, Oreg., poly(chlorotrifluoroethylene) such as Halocarbon Oils from Halocarbon Product Corp., River Edge, N.J., perfluoropolyalkylether such as Galden™ from Ausimont or Krytox™ Oils and Greases K-Fluid Series from DuPont, Delaware. In one preferred embodiment, poly(chlorotrifluoroethylene) is used as the dielectric solvent. In another preferred embodiment, poly(perfluoropropylene oxide) is used as the dielectric solvent. A pre-patterned stencil from Photo Stencil, Colorado Springs, Colo., was used as the male mold for microembossing and Frekote™ 700-NC from Henkel was used as the mold release. The coated film was then embossed by the stencil using a pressure roller at room temperature. The coating was then UV cured for about 20 minutes through the Mylar™ film using a Loctite Zeta 7410™ exposure unit equipped with a metal fluoride lamp with an intensity of 80 mW/cm2 at 365 nm. The embossed film was then released from the mold to reveal well-defined microcups having lateral dimensions ranging from 60 μm to 120 μm (200-400 dpi) and a depth ranging from 5 μm to 30 μm as measured by optical profilometry and microscope (FIGS. 4 a-4 c). A primer solution comprising of 5 parts of Ebecryl™ 830, 2.6 parts of SR-399™ (from Sartomer), 1.8 parts of Ebecry™ 1701, 1 part of PMMA (Mw=350,000 from Aldrich), 0.5 parts of Irgacure™ 500, and 40 parts of methyl ethyl ketone (MEK) was coated onto a 2 mil ITO/PET film (60 ohm/sq., from Sheldahl Inc., MN) using a #3 Myrad bar, dried, and UV cured by using the Zeta 7410™ (5 w/cm2, from Loctite) exposure unit for 15 minutes in air. The microcup formulation prepared in Example 10 was coated onto the treated ITO/PET film with a targeted thickness of about 50 μm, embossed with a Ni—Co male mold having a 60(length)×60 (width) μm repetitive protrusion square pattern with 25-50 μm protrusion height and 10 μm wide partition lines, UV cured from the PET side for 20 seconds, removed from the mold with a 2″ peeling bar at a speed of about 4-5 ft/min. Well-defined microcups with depth ranging from 25 to 50 μm were prepared by using male molds having corresponding protrusion heights. Microcup arrays of various dimension such as 70(length)×70 (width)×35(depth)×10 (partition), 100(L)×10(W)×35(D)×10(P), and 100(L)×100(W)×30(D)×10(P) μm were also prepared by the same procedure. The electrophoretic fluid prepared in Example 12 was diluted with a volatile perfluorinated co-solvent FC-33™ from 3M and coated onto the 70(length)×70(width)×35(depth)×10(partition) microcup array prepared in Example 11. The volatile cosolvent was allowed to evaporate to expose a partially filled microcup array. A 7.5% solution of polyisoprene (97% cis, from Aldrich) in heptane was then overcoated onto the partially filled microcups by a Universal Blade Applicator with an opening of 3 mil. The overcoated microcups were then dried at room temperature. A seamless sealing layer of about 7-8 μm thickness (dry) with acceptable adhesion and uniformity was formed on the microcup array. No observable entrapped air bubble in the sealed microcups was found under microscope. A second ITO/PET conductor precoated with an adhesive layer was laminated onto the sealed microcups. The electrophoretic cell showed satisfactory switching performance with good flexure resistance. No observable weight loss was found after being aged in a 66° C. oven for 5 days. The procedure and formulation of Example 16 were repeated, except that the TiO2 particles TINT-AYD® PC9003 were precoated with a basic copolymer (PVPyBMA) of 4-vinylpyridine (90%) and butyl methacrylate (10%) (Aldrich) by the procedure described below. 50 Parts of PC-9003 were dispersed into 25 parts of ethanol and 25 parts of a 10% solution of the PVPyBMA copolymer in methanol, homogenized for 5 minutes and then ultrasonicated for 10 minutes. The resultant slurry (12 parts) was added into 100 parts of a solution containing 1.2% of Krytox® 157FSH in HT-200™ and homogenized at room temperature (10K speed) for 30 minutes. The alcohol was stripped off at 80° C. and the dispersion was further ultrasonicated for 30 minutes. A 0.8 wt % (based on dispersion) of blue dye FC-3275 was added to the above dispersion, filled into the 70(length)×70(width)×35(depth)×10(partition) microcup array prepared in Example 11, and the filled microcups were sealed as Example 16. A seamless sealing layer of about 4-5 μm thickness (dry) with acceptable adhesion and uniformity was formed on the microcup array. No observable entrapped air bubble in the sealed microcups was found under microscope. A second ITO/PET conductor precoated with an adhesive layer was laminated onto the sealed microcups. The electrophoretic cell showed fair switching performance with good flexure resistance. No observable weight loss was found after being aged in a 66° C. oven for 5 days. Krytox® methyl ester (17.8 g, MW=˜1780, n=about 10, DuPont) was dissolved in a solvent mixture containing 12 g of 1,1,2-trichlorotrifluoroethane (Aldrich) and 1.5 g of α,α,α-trifluorotoluene (Aldrich). 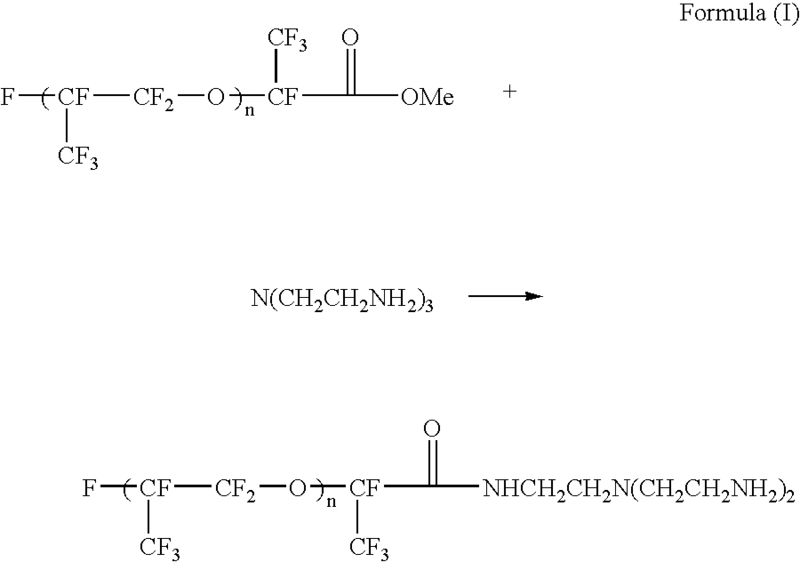 The resultant solution was added drop by drop into a solution containing 7.3 g of tris(2-aminoethyl)amine (Aldrich) in 25 g of α,α,α-trifluorotoluene and 30 g of 1,1,2-trichlorotrifluoroethane over 2 hours with stirring at room temperature. The mixture was then stirred for another 8 hours to allow the reaction to complete. The IR spectrum of the product clearly indicated the disappearance of C═O vibration for methyl ester at 1780 cm−1 and the appearance of C═O vibration for the amide product at 1695 cm−1. Solvents were removed by rotary evaporation followed by vacuum stripping (1 torr) at 100° C. for 4-6 hours. The crude product was then dissolved in 50 ml of PFS2™ solvent (low m.w. fluoropolyether from Ausimont) and extracted with 20 ml of ethyl acetate three times, then dried to yield 17 g of purified product (Rf-amine 1900) which showed excellent solubility in HT200™. The procedure of Example 24 was followed, except that the sealing composition was replaced by a composition consisting of 8.0 parts of Kraton™ G1650, 0.9 parts of Kraton™ GRP 6919, 0.3 parts of Cab-O-Sil TS-720™ (from Cabot Corp., Tuscola, Ill.), 0.46 parts of Multifunctional acrylate SR306™ (from Sartomer), 0.22 parts of SR9020™, 0.03 parts of Irgacure™ 369 (from Ciba), 0.09 parts of isopropylthioxanthone (ITX, from Aldrich), 81 parts of Isopar™ E (from ExxonMobil Chemical), and 9 parts of isopropyl acetate (from Aldrich). The sealed microcup array was post cure by UV for 5 minutes using a Loctite Zeta 7410™ exposure unit equipped with a metal fluoride lamp with an intensity of 80 mW/cm2 at 365 nm. The electrophoretic cells showed satisfactory switching performance with good flexure resistance. No observable weight loss was found after being aged in a 66° C. oven for 2 days. b) hardening in situ a polymeric sealing layer which polymeric sealing layer forms a contiguous film on said electrophoretic fluid to enclose said electrophoretic fluid within each of said cells. 2. The process of claim 1 wherein said cell is partially filled with said electrophoretic fluid. 3. The process of claim 1 wherein said polymeric sealing layer is formed from a sealing composition comprising a material selected from the group consisting of polyvalent acrylate or methacrylate, cyanoacrylates, polyvalent vinyl, polyvalent epoxide, polyvalent isocyanate, polyvalent allyl, and oligomers or polymers containing crosslinkable functional groups. 4. The process of claim 3 wherein said composition further comprises an additive selected from the group consisting of surfactants, antioxidants, initiators, catalysts, crosslinkers, thickeners, polymer binders, pigments, dyes and fillers. 5. The process of claim 4 wherein said filler is selected from the group consisting of silica, CaCO3, BaSO4, TiO2, metal particles, metal oxides and carbon black. 6. The process of claim 3 wherein said polyvalent vinyl is vinylbenzene, vinylsilane or vinylether. 7. The process of claim 1 wherein said polymeric sealing layer is formed from a sealing composition having a specific gravity lower than that of the electrophoretic fluid. 8. The process of claim 7 wherein said sealing composition comprises a thermoplastic, thermoset or a precursor thereof. 9. The process of claim 7 wherein said sealing composition comprises a thermoplastic or thermoset precursor. 10. The process of claim 1 wherein said hardening of said polymeric sealing layer is accomplished by solvent evaporation, interfacial reaction, moisture, heat or radiation. 11. A sealing process for the manufacture of an electrophoretic display, which process comprises hardening a sealing composition on top of an electrophoretic fluid wherein said sealing composition has a specific gravity lower than that of the electrophoretic fluid. b) hardening said sealing composition during or after it phase separates and forms a supernatant layer above the electrophoretic fluid. b) hardening said sealing composition. 14. The sealing process of claim 13 wherein said sealing composition has a specific gravity lower than that of the electrophoretic fluid. 15. An electrophoretic display comprising an electrophoretic fluid wherein said electrophoretic fluid is enclosed by partition walls and a sealing layer formed from a composition having a specific gravity lower than that of the electrophoretic fluid.